Q. How do I find information on mental disorders? 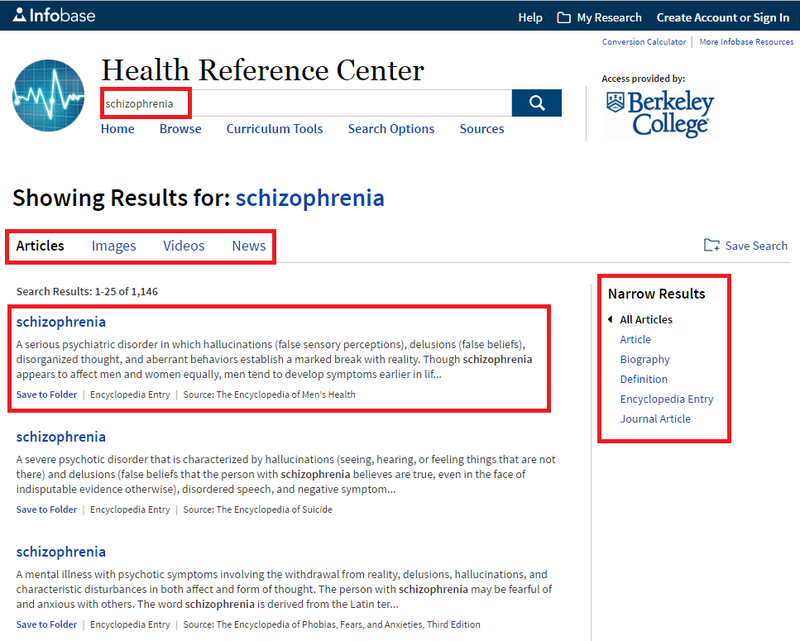 For background and general info about different mental disorders, try searching in one of our encyclopedic databases like Britannica Academic, Credo Reference, Gale Virtual Reference, and Health Reference Center (Infobase). These articles in these databases are a good starting point for research, but they are not scholarly articles. Use these databases to find definitions, descriptions, and other foundational information. See an example search in an encyclopedic database below. For scholarly articles about mental disorders, try searching in one of the following research databases. See an example search in a research database below. Health & Medical Collection (ProQuest): Includes coverage of "clinical and biomedical topics, consumer health, health administration, and more." Remember to check the "full-text" box and use keywords to search. PubMed Central: A "free full-text archive of biomedical and life sciences journal literature at the U.S. National Institute of Health's National Library of Medicine." Psychology (ProQuest): "Coverage ranges from behavioral, clinical, cognitive, developmental, experimental, industrial, and social psychology, along with personality, psychobiology, and psychometrics." Geared towards researchers and students. Remember to check the "full-text" box and use keywords to search. STAT!Ref: This database includes the title Kaplan & Sadock's Synopsis of Psychiatry: Behavioral Sciences/Clinical Psychiatry - 11th ed. (2015). You can browse this entire title by clicking on it in the "Titles" box on the left sidebar or enter your search terms in the search box. Additionally, the American Psychological Association (APA) publishes the Diagnostic and Statistical Manual of Mental Disorders (DSM), which researchers can use as a classification and diagnostic tool. The current version is the DSM-5, published in 2013, and is available as part of the library's reference collection at the Newark, New York City, Paramus, White Plains, Woodbridge and Woodland Park libraries. Reference books can be used within the library. The library has other books on psychiatry, psychology, and mental disorders which can be searched for in the catalog. 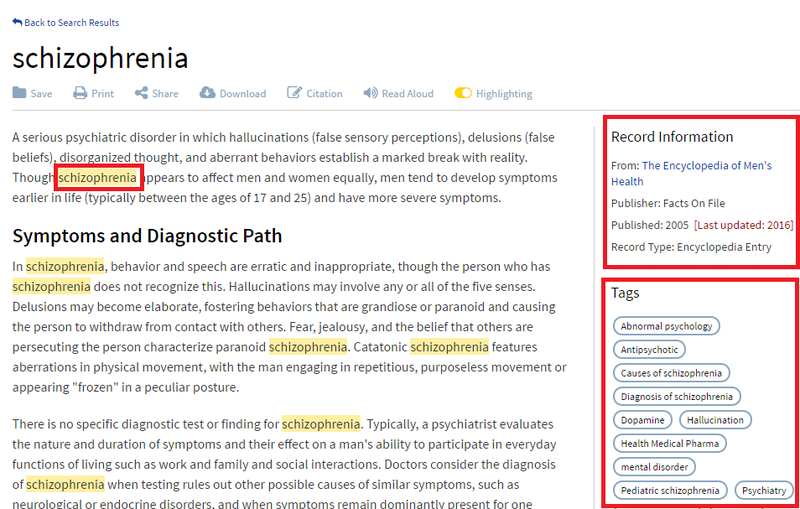 Since this is an encyclopedic database, I can use a general search term like "schizophrenia." The results list will show you the title of the article, the first paragraph or so, and the source. On the top menu and right sidebar are options for narrowing down your results. When you click on a title from the results page, the article will open up. Your search term will be highlighted wherever it appears in the article. The top right sidebar has information about the source of the article. The bottom right sidebar has category tags for the article. Click on some of the tags to see articles related to your topic. For a research database like ProQuest's Psychology database, I will create a search strategy meant to narrow my results based on my search topic. I am searching for: schizophrenia and "treatment options" and women. Keywords are connected by the word "and" so that the database pulls articles which include all my keywords. Quotation marks are used for keywords which include 2 or more words so that the database pulls articles which include the exact phrase I am looking for. Also, the boxes for Full text and Peer reviewed are checked so that I only see results for scholarly articles that I have full access to. This search yields 1,129 results. The results list shows the article title, author, and publication information. It also includes the abstract so I can skim the results page for articles which look relevant to my search. The left sidebar includes options for narrowing my search further by date, subject, and other criteria. Q. How can I select the best search terms/keywords for my search?